All new lunations deemed eclipses are not equal, for those that succomb to total blackening of the Sun are far more potent than those in which only a sliver of a shadow obscures our solar light. The Partial Solar Eclipse in Cancer on July 12 (or July 13, depending upon time zone) is one such eclipse, as it will only be visible in the southern reaches of Australia and the south pole region. The first solar eclipse in Cancer is partial due to its distance from the lunar nodes, 15º12′ from the true node position. However, even though its not the most intense type of eclipse, it’s incredibly dynamic due to its Plutonic quality. The Cancer syzygy is closely aligned with the planetary nodes of Pluto while opposing Pluto at the same time. This creates the potent matrix of the partial eclipse conjoining the North Node of Pluto, while Pluto is aligned with its own South Node. We thus we will be experiencing a total activation of the entire orbital arc of Pluto, and a colossal release of all things Plutonic into our collective field. Eclipses have a long association with destined events due to new forms entering our life in the weeks surrounding them, often with an unexpected gravitas, while other forms we had previously felt securely attached to pass away. The Partial Solar Eclipse in Cancer is the first activation of an upcoming cycle of eclipses in Cancer and Capricorn, with the next Partial Solar Eclipse in Capricorn in January 2019, followed by a Total Solar Eclipse in Cancer in July 2019. As a result the Plutonic eclipse will be revealing first intimations of new themes that will become more firmly established in our lives once the lunar nodes make the switch into Cancer and Capricorn in November 2018. The eclipse emphasizing areas of future oriented growth is further shown by it occurring on the side of the North Node of the Moon, with the Moon waxing toward a conjunction with its ascending node across our ecliptic, moving from southern toward northern latitude. However, since our Sun will be partially covered by the shadow of our Moon, it suggests there are elements of the irrational, deep unconscious, potent dream experiences of night, and charged memories that will be oozing or erupting into conscious awareness. Since the North Node of the Moon is in Leo and we will be experiencing a Total Lunar Eclipse in Aquarius at the end of July combined with Mercury moving retrograde in Leo, the Cancer lunation opposing Pluto in Capricorn brings the Cancer-Capricorn polarity strongly into a context dominated by Leo and Aquarius. I’m reminded of a talk I heard Jason Holley give on Cancer that explored its archetype through the myth of the crab in the constellation sent by Hera to attack Heracles. Holley described lunar material as being emotional openings to the fertile void, a realm of memories that is nonlinear, somatic, and implicitly pulls things into its own rhythm- thus it as if the crab has emerged from the undifferentiated unconscious to attack Heracles, the solar hero wearing lion skin. Holley noted that when our internal world lacks a sense of structure and order it leads to reliance on external sources for a sense of stability and safety. If one’s capacity to contain emotional experience internally is not developed, it will be delegated to others rather than claimed from one’s own sense of inner authority. The opposition from Pluto in Capricorn to the lunation will force awareness of any such issues. Pluto has been associated with Shiva and his fierce destructive aspects by many astrologers, as the experience of a hard aspect from Pluto can not only feel like a complete destruction of one’s personality, but also be experienced through devastating losses of structures and relationships we had been attached to. When we stop resisting, denying, or being overly defensive, allowing our ego to be destroyed in the quakes of Pluto, we open ourselves to the treasured gifts we will eventually unearth in the underworld process. Richard Tarnas in Cosmos and Psyche gave an excellent summary of terms associated with Pluto including “the principles of elemental power, depth, and intensity; with that which compels, empowers, and intensifies whatever it touches, sometimes to overwhelming and catastrophic extremes; with the primordial instincts, libidinal and aggressive, destructive and regenerative, volcanic and cathartic, eliminative, transformative, ever-evolving . . . violent purgatorial discharges of pent-up energies, purifying fire; situations of life and death extremes, power struggles, all that is titanic, potent, and massive.” Collectively we will be experiencing a massive purge of all things Plutonic in the time surrounding the Partial Solar Eclipse due to the eclipse conjoining the North Node of Pluto, with Pluto conjoining its own South Node. Within the discharge can be found vital empowerment as described above by Tarnas, the question becoming what do you want to empower? Planetary Nodes can be confusing for some people to understand when first coming across them, but I can vouch from years of experience with them that they are well worth the effort to integrate into astrological practice. There are valid reasons to use heliocentric planetary nodes (calculated from the accurate concept of the Sun being center of our solar system) as well as the geocentric nodes (calculated as they appear from our Earth-bound perspective as the center). The Partial Solar Eclipse in Cancer is closely conjoining the geocentric North Node of Pluto (geocentric North Node of Pluto is 20º33′, lunation is 20º41′ Cancer) and Pluto is tightly conjoined its own geocentric South Node (Pluto at 20º00′, geocentric South Node of Pluto is 20º32′). Pluto and the Partial Eclipse are also closely conjoining the heliocentric nodes of Pluto. This means that Pluto is in the process of crossing the ecliptic from northern latitude into southern. For astronomical information and diagrams on the alignment of the lunation with Pluto, which also means someone on Pluto with a massive telescope could watch the earth transit in front of the Sun, see here and here. In contrast to the current transit of Pluto across its own South Node, Pluto transited across its North Node in 1929 through 1931, stationing retrograde in close proximity in October 1928. The year 1929 is famous of course for the Wall Street stock market crash that led into the Great Depression of the 1930s. Dane Rudhyar in his landmark text The Planetary and Lunar Nodes cut to the heart of the significance of paying attention to planetary nodes, writing that “in philosophical traditions concerning the meaning of astrology it was stated that the fundamental reality of what we call a planet is not its material mass but rather the space which its movements define.” Planetary nodes bring awareness into the relationships between the entire orbital arcs of planets in our solar system, therefore in archetypal terms we are talking about discerning relationships between the entirety of the archetypal cycle of each celestial wanderer to one another, and to our experiences on Earth. One of the most significant ways of thinking of the nodes is to consider them as two “gates.” When a planet [Rudhyar includes the Moon here] is at its north node, its essential function and quality in the solar system is focused upon our Earth-space which is then most able to absorb and assimilate it. When the planet is at its south node what is released as “substantial” factors are the results of the relationship between the characteristic nature of the planet and whatever in the Earth-space has absorbed its power. If the relationship has been positive, then what has been absorbed has also been “assimilated” and integrated to the Earth-consciousness and has produced a new “seed,” i.e., new experiences and values. If the relationship has proven negative, what is being released or exteriorized are disintegrating materials, or negative existential results. It’s easy to find the “disintegrating” and “negative existential” manifestations of the Pluto archetype in current events these days. There has in fact been a re-activation of white nationalism and supremacy and many people have had fears of another rise of fascist forces rising. There is also the additional factor that Saturn also has its South Node in Capricorn close in degree to the South Node of Pluto, and that Saturn is now heading toward a conjunction with Pluto at the beginning of 2020 that will be aligned with the South Nodes of both Pluto and Saturn. It is in fact striking that the second World War erupted after Pluto crossed its ascending node, and that the “Cold War” in the aftermath took shape in alignment with a conjunction between Pluto and Saturn. NATO was then formed between North American and European nations against the threat they feared from the Soviet Union, and today as this eclipse forms with Pluto on its own South Node the relationships within NATO are taking center stage in current events. The last time Pluto was conjoining its South Node was the beginning of the 1770s leading into the Revolutionary War that created the United States of America. As has been often discussed, the USA is now approaching its first ever Pluto return, with the coming conjunction of Pluto and Saturn being intrinsic. The USA is known as a country formed by immigrants, a creation also involving the displacement and destruction of indigenous populations as well as enslavement of people from the African continent. Today all of these issues are flooding collective events, including the controversial “Zero Tolerance” policy of the U.S. administration that separated family members attempting to cross the border. It is striking how resonate the term “Zero Tolerance” is with the archetypal meaning of the Pluto and Saturn cycle. Within the raging thunderbolts and hurtling winds of collective history, the Partial Solar Eclipse occurring in Cancer illuminates our capacity on personal levels to nurture and protect what we hold most dear. Within relationships with loved ones and within larger spheres of community, the opposition from Pluto to the eclipse highlights the necessity of taking the personal responsibility to live in alignment with one’s integrity and to devote choices and commitments in service to the greater good for all beings, not just those we feel bound to by family or culture. The polarity of Cancer to Pluto and Saturn occupying Capricorn, in tandem with the nodes and coming Total Lunar Eclipse along the Leo and Aquarius axis, places importance on finding our inner emotional security so that we can claim personal power without the shadow of needing to control others or be competitively threatened by the power of others. The Cancer Partial Solar Eclipse holds potential to discover the essential value you want to cultivate within that you can then share with others for their own support. The eclipse is separating from a trine with Neptune in Pisces, as Neptune continues to be in range of a sextile with Pluto in Capricorn. Neptune’s transit in Pisces has coincided with massive illusions and disillusionment, the ascendancy of “fake news” and massive amounts of the populace getting their imaginal fix from phones, tablets, and other electronic devices all being closely monitored by the hierarchical power structures we can associate with Pluto in Capricorn. Part of reclaiming our inner security is engaging with our inner imaginal potency and our capacity to help co-create through our participation the world we hope to dream into being, rather than the nightmare we fear. The Partial Solar Eclipse is in the exaltation of Jupiter, with Jupiter in a trine to the eclipse. Jupiter holds monumental influence due to stationing direct on July 10, two days before the eclipse. Jupiter is in the home of Mars, as the red planet is currently retrograde en route to aligning with an incredibly intense Total Lunar Eclipse in Aquarius at the end of July. Jupiter brings hope and reason for faith in the unknown, yet this simultaneously requires unflinching awareness of the depths and shadow of current circumstances. Jupiter is now in forward motion through the rest of Scorpio where it will reside until entering its home in Sagittarius at the beginning of November. It is a bright Evening Star shining in the same sky that both Saturn and Mars can be seen in. The forward momentum of Jupiter will bring corresponding opportunities to find sources of expansion and growth within the disintegration of societal structures signified by Pluto’s influence on the eclipse. With the activation of Pluto, this likely could come with connecting to ancestral lineages whether that is one’s blood family or family of like-minded souls. The Leo North Node of the Moon emphasizes creative actualization and pursuing desires that bring visceral vivification rather than restraint. With the South Node of the Moon in Aquarius, we are experiencing a purification of our humanitarian ideals and how we can contribute to creating the type of global community we wish to exist within. Jupiter in Scorpio will thrust us into exploration of difficult questions and answers, enabling us to get at the underlying roots of our current circumstances. Mars retrograde in Aquarius is not in aspect to the eclipse, but is one of the most important underlying factors. We’ve been experiencing Mars retrograde since June 26 and so now have a better sense of what elements of life are shifting in correspondence. A more recent element is that Mars went out of bounds by southern declination on July 7, adding in a higher degree of freedom seeking to its retrograde vibe. Just as Mars is at its brightest red at night as an Evening Star, so is the inner heat we feel in correspondence also inflamed. Desires may be emerging that we have been denying or unaware of previously that are in fact vital elements of our nature to begin integrating and embodying. At the south node one does not build personality; one may expand it, releasing its contents in full dedication to a community and an ideal. There are many ways of speaking of sacrifice, some quite meaningless, even actually egocentric or masochistic. But the true meaning of sacrifice is “making sacred”; and this implies a complete dedication of one’s thoughts to what one may call either God or mankind – – or to a specific group, culture or ideal. This means a surrender of the ego-will. The intensification of Mars will be building during the entire forthcoming waxing cycle of the Moon, as Mars will oppose the Sun at the heart of its retrograde at the same time as the Total Lunar Eclipse on July 27. While this is happening Mars is also getting closer and closer to receiving Chiron in Aries through a sextile, and forming a catalyzing square aspect with Uranus in Taurus. At times we will need to retreat into inner spaces to process everything coming up in correspondence. As this will all be happening in the middle of eclipses, the information and messages coming our way could be nonlinear and feel irrational. Be open to what is coming up, while maintaining discernment for what to act on and what to simply witness within. At such a Plutonic syzygy, it is fitting that Venus in Virgo is applying to a conjunction with Ceres. Venus is in its fall in Virgo, which can be seized in terms of walking and witnessing with awareness the myriad forms of suffering occurring around us, offering service where appropriate. The world is full of suffering, yet Venus and Ceres in Virgo also offer us the potential to ground and find the resources around us that will nurture us and others. Their alignment offers strong discernment found within subjective inner senses and intuition. Venus and Ceres also support transmuting nervous or anxious energy into creative work or productive maintenance such as focusing on needed cleaning, repair, or purification. Venus and Ceres are in the home and exaltation of Mercury, which is notable because Mercury is in Leo, the home of the Sun being partially eclipsed. Moreover, Mercury is bright as an Evening Star and on its way toward stationing retrograde in Leo in a couple of weeks. Gary Caton has also been doing a lot of interesting research into the retrograde loop patterns Mercury forms when retrograde, and the one Mercury is now forming is notable because it will take it into extreme southern latitude just like the Mars retrograde loop is also taking it into extreme southern latitude. This is because Mercury in Leo is at the southern bending to its own heliocentric nodes in Taurus and Scorpio. Mercury is conjoining its geocentric South Node at the Partial Solar Eclipse, meaning it is now heading toward southern latitude and will not return back to cross over the ecliptic to go into northern latitude again until August 28. Furthermore, Mercury is in Leo is at 17 degrees at the time of the eclipse, the same degree it will be when it experiences it’s inferior conjunction with the Sun at the heart of its retrograde journey. While the writing in the previous paragraph may sound like a confusing foreign language, there is a simple takeaway. The combination of all of this happening for Mercury with Venus and Ceres coming together in Virgo suggests rich fertility to be found in our inner landscapes. The Partial Solar Eclipse occurs within the third decan of Cancer associated with the Four of Cups card illustrated above by Pamela Colman Smith. The Moon rules the third face of Cancer, bringing extra potency to the shadow cast by Luna upon our solar light in the eclipse. In the image of the Four of Cups illustrated by Pamela Colman Smith above, we see someone sitting on the roots of a tree with three golden cups ready to be filled in the foreground, with a fourth cup being magically offered by an otherworldly hand. The recipient of this magical offering appears to be engrossed in contemplative thought, allowing inner exploration to guide subsequent choice. Austin Coppock in his book on the decans 36 Faces gave the image of “The Overflowing Cup” to the third face of Cancer, declaring that it reveals the conflict of choosing “luxurious excess” within “a world of limited material resources” in which “the attainment of luxury for one entails deprivation for others,” leading to a “hidden violence and secret competition entailed within the quest for luxury” (p. 115-6). Coppock noted this seems to be the perspective of the young man seated in the Four of Cups with an ascetic air of refusing to accept more than he needs, and therefore bringing up questions around choosing the extra cup of luxury. Significantly, Coppock additionally noted the spiritual dimension of luxury, the “ever-refilled” cup offered by Spirit, “the endless luxury of the limitless,” the “ever present energy of the natural world- the chi which emanates from all living things . . . an ocean even a thirsty god could not drain” (p. 117). Hecate has dominion within the third face of Cancer according to the Hellenistic text the 36 Airs. Finding ourselves at a collective crossroads, facing the darkness of the unknown, we may turn to Hecate for guidance. Hecate connects with the luminosity of the Moon, as The Chaldean Oracles called her “the font and stream of the blessed noetic” who “pours forth a whirling generation upon All.” Moreover, Hecate is also the wise crone and dark mother who connects with the nocturnal, melancholic nature of Saturn’s home in Capricorn (check out this article by Charles Obert on Saturn as Feminine and Crone). Hecate rules over the phases of the Moon, all realms of the upper world and the underworld, crossroads, magical craft, midwifery, and prophetic mediation among many other significations. For ages Hecate has been available to call for regenerative power during dark nights of the soul. She serves as a reminder of the inner guidance we can call upon to discern what choices and steps to next take on our path through the liminal season of eclipses and retrograde phases of Mars and Mercury we now enter. Tarnas, Richard. (2007). Cosmos and Psyche: Intimations of a New World View. Plume. I’m excited to share the release of the second part of my interview with Christina Caudill on the Radiant Astrology Podcast. We did this interview back on the day Uranus first entered Taurus, and in this installment we primarily focus on the meaning of the Uranus opposition transit as well as some of the meaning of Uranus entering Taurus. If you were born with Uranus in Scorpio (1974 – 1981) the entrance of Uranus into Taurus brings you into the Uranus opposition period that can bring about a release and break from past patterns. If you have Uranus in the first ten degrees of Scorpio this next year will be especially big for you as both Mars and Venus will be going retrograde in range of aspect in addition to Uranus in Taurus. I was born with Uranus at the beginning of Scorpio, and I’ve already experienced my first major Uranus opposition event: due to the cancellation of another speaker, I was selected to give an additional talk at the upcoming United Astrology Conference. Fittingly, I will be talking about Uranus oppositions, and so not only is this appropriate due to me going through a Uranus opposition right now, but I also have to put it together at the last moment at Uranian speed! The Uranus opposition that occurs as we enter the mid-life of our forties has a deservedly dramatic reputation. Known as a lightning strike of revelation within cycles of personal development, it brings shakeups that upend the previous status quo of our life. This talk will explore ways to respond to the liberating impulses that arise in correspondence, as well as its connection to transits involving Jupiter, Saturn, Neptune, and Pluto that lead into it. The changeable nature of Mercury is found in its synodic cycle and its shifts between being direct and retrograde. The meaning of Mercury’s cycles will be applied to the secondary progressed chart, where Mercury’s movement across a lifetime demarcates vital periods of personal development. Gray will explain how to interpret the shift of progressed Mercury from being direct to retrograde and vice versa, and what to pay attention to in relation to the natal chart. If you are coming to UAC, I hope to see you there. Make sure to come up and say hello. It would be great to meet any of you who will be there in person! The dreamy vision reverberating in mind, the eyes catch the mirrored sunlight caressing the waves from the deep. Colors transfigure the sky, undulating with hues bringing passing magic to the senses. We call it a brainstorm, the inspiration of inhaling divine guidance. What comes next reveals the intersection between internal and external realms, the circumstances of our lives and our motivation to dedicate time and effort into manifesting a fragment of what our soul beheld in quiet, secretive contemplation. The New Moon in Pisces on March 17 is a gate through which we enter an intensified quality of time, one which demands focused follow through if we wish to bring the inner workings of psyche into reality. The New Moon is united with Chiron in Pisces and forms a catalytic square with Mars at the very, very end of Sagittarius. Mars will enter Capricorn only a few hours after the lunation, and so the freshly waxing Moon will be in Aries when it forms an exact square with Mars later in the day. Mars will therefore receive the reinvigorated dark Moon into its exaltation of Capricorn, and as the Moon continues to build toward new light it will find itself contained within squares with both Mars and Saturn in Capricorn. Mars and Saturn glow these days as Morning Stars, full of essential dignity to bring about their significations in the empowered sign of the Sea Goat. These combined influences on the New Moon in Pisces bring the inner fortitude required to bear the challenges and wounds of temporal matter in order to work toward sturdy development of goals. The waters of Pisces wash ashore a seed that needs tending care yet has the resiliency to put down roots and bloom in even the harshest conditions. In fact it may just be the difficulties of the surrounding environment that help to foster a beauty of form more unique than could happen anywhere else. Plans enacted now will necessitate the type of mutable flexibility the sign of Pisces has been long renowned for, a capacity for shifting with fertile readiness to the angelic guidance found in the moment. Jupiter rules the New Moon having recently shifted into slow retrograde movement in Scorpio. Interestingly, at the very moment of the New Moon perfecting, Jupiter will be ruling the New Moon in Pisces as well as Mars at the very end of Sagittarius. Significantly, the New Moon is separating from a trine with Jupiter, signifying a cherished vision or illuminated wisdom we are carrying forward into the coming lunar cycle. Jupiter these days has a slow, churning, inwardly directed focus and is applying toward a sextile with Pluto in Capricorn that will perfect April 14. The month following the New Moon will be an intense brewing of Jupiter and Pluto supporting a purging of inauthentic influences and a deepening of feeling into innermost yearnings. Jupiter in Scorpio is in the middle of its most intense engagement with Pluto in Capricorn, having first formed an exact sextile with Pluto on January 15. Jupiter has been harmoniously engaging with Pluto for the entirety of 2018, and after they begin to separate from one another toward the end of April, they will return to engage a final time again in August and September. As always with Pluto we may experience secrets being revealed, taboos tested, and an initiatory journey, yet the supportive sextile formed with Jupiter suggests the underworld treasure and richness also associated with Pluto can be discovered. These influences on the Pisces New Moon signify the importance of persisting toward goals aligned with inner essence rather than external influences of acculturation that are out of alignment. This is of supreme importance for just as Jupiter is slowly peeling back toward Pluto, Mars and Saturn are blazing a trail forward to Pluto in Capricorn. In the wake of the New Moon, Mars will both move out of bounds by declination and also enter into Capricorn. Mars out of bounds is wilder, fiercely more independent and willful than Mars would otherwise be in Capricorn, while also applying to a conjunction with Saturn. Capricorn is the exaltation of Mars, the nocturnal and earthy home of Saturn that tempers the inflammatory tendencies of the red planet. Mars out of bounds in its exaltation is the wandering heretic genius who not only operates outside the confines of status quo conditioning, but also embodies the savvy wherewithal to strategize and effectively organize timeframes for work. Mars wants the freedom to act out dynamic potential and has the motivation to seek outlets for expression. Finding channels for Mars expression will be essential. Mars will remain out of bounds until the first week of April, and it is on April 1 that it will form its exact conjunction with Saturn. Mars will not unite with Pluto until the end of April, and so although that alignment is over a month away, as soon as Mars enters Capricorn we will begin to feel the intensity of its eventual perfection. In terms of collective events, there is no sugar coating the numerous tragedies that will be told in correspondence. However, within protected personal spheres there will be opportunities to initiate and develop vital work. Projects built under the intense eyes of Mars, Saturn, and Pluto may develop at a slower pace but will ultimately possess profound persistence to survive over the long haul. Thus the 2018 narrative takes a dramatic turn at the Pisces New Moon, as the forces of Mars, Saturn, and Pluto promise a meeting with our nemesis and a forging of inner fire in response. While being one of the most challenging periods of the year, it will also be a timeframe that can lead to immense growth in strength and aptitude. Fire will be found in the twilight of sunset in the forms of radiant Venus and glittering Mercury glowing bright. Mercury is beginning to descend from maximum elongation as an Evening Star at the Pisces New Moon, falling lower toward the horizon each day as it approaches its upcoming retrograde period. Mercury will station retrograde following the Aries Equinox on March 22, meaning that the Pisces New Moon contains both the rebirth of the equinox as well as the regeneration of Mercury retrograde within its lunar cycle. As a result we must be ready for the numerous twists, turns, and unexpected events that will accompany a Mercury retrograde period that looks to be more volatile than normal. Take pleasure in the sunsets surrounding the New Moon, for the lack of moonlight will darken the backdrop of Mercury and Venus shining bright together in twilight. As delightful as Mercury and Venus appear together in the sky, within the aspects of the astrological atmosphere they are in a challenging position of forming a whole sign square to the intense Capricorn conglomerate of Pluto, Saturn, and Mars. After the Sun enters Aries on the equinox, we can add our solar light to the side of Venus and Mercury facing off with the Capricorn heavyweights. While the Sun, Venus and Mercury together in Aries incite desires for freely boundless expression, the tension coming from Capricorn planets demands channeling expression through contained forms. We have been presented with an extended period to integrate the heartfelt values of Venus with the mental reasoning and expression of Mercury: Mercury and Venus recently united on March 4 and will again on March 19. 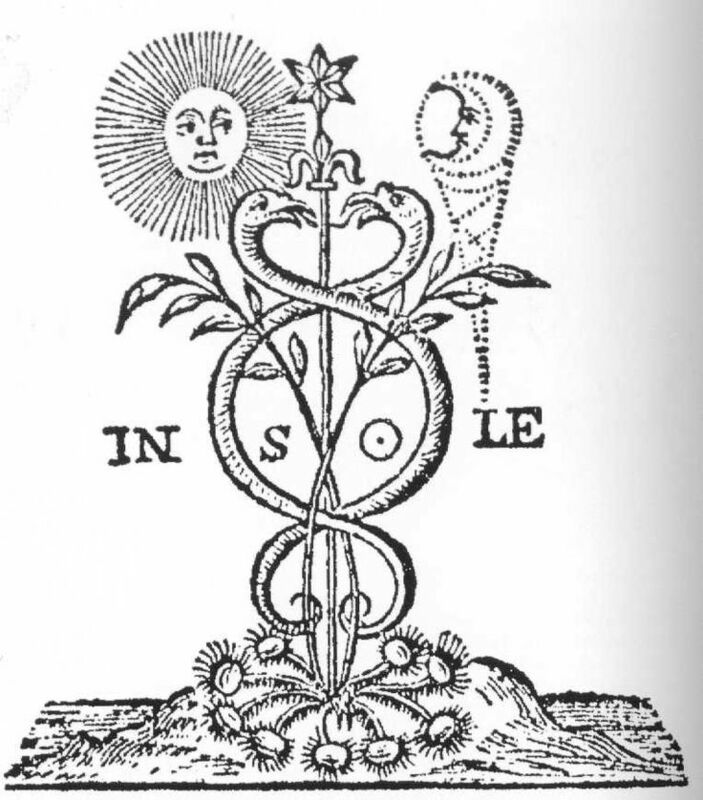 The present union of Venus and Mercury is forming a trine to the North Node of the Moon in Leo and a sextile to the South Node of the Moon in Aquarius. The fiery determination and willfulness of Venus and Mercury in Aries presents new choices to be made that are in greater alignment with our authentic path. As Venus and Mars are in the home of Mars, and Mars will be applying to a conjunction with Saturn in the home of Saturn, it will be imperative to embody self-discipline and integrity of purpose in the process. Challenges may feel overwhelming, yet sustaining focused determination will reap rewards in the end. The New Moon arises in the third face of Pisces associated with the Ten of Cups card illustrated above by Pamela Colman Smith. An image and card linked with emotional fulfillment of creative dreams, it also carries warnings of becoming lost in romantic fantasy. The image of rainbows, happy lovers, and playful children captures the essence of an ideal goal for many, and serves as a striving symbol for those with different goals in mind. Austin Coppock in his book 36 Faces ascribed the image of “A Cup of Blood” to this decan, as he wrote “the third face unfolds as the quest for true and perfect love” that ultimately requires sacrifice. Coppock rightly described this decan as a place in which we can experience the “heights of agony and ecstasy,” both the disillusionment of betrayal as well as the bliss of rich reception. With Mars, Saturn, and Pluto present in Capricorn in the coming cycle we have the power of the scythe on our side. Be mindful of what you cultivate, and generous in the harvest you share with others. The sharing of love and resources in partnership and within collaborative community will bolster resiliency in the face of coming challenges.